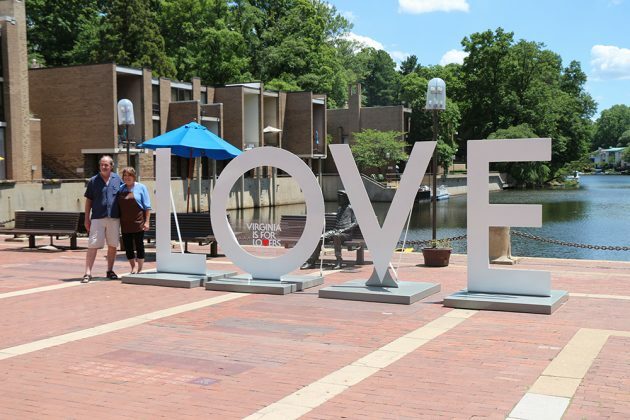 Lake Anne is always a nice spot for a photo op, but it’s now just a little more “LOVE”-ly. Workers from the Virginia Tourism Corporation arrived at Lake Anne Plaza on Friday afternoon with four big letters in tow. The “LOVE” display, 16 feet long and over six feet high, will be at the plaza through Wednesday. 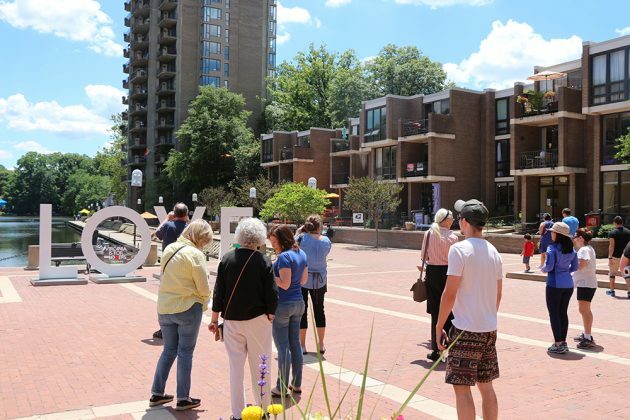 It was set up to frame the statue of Reston founder Bob Simon within the O.
Maurisa Potts, Lake Anne Plaza public relations representative, said the application from VTC she had to fill out to be considered for the display asked what makes the location special. Chalk on the Water will be taking place Saturday and Sunday at Lake Anne Plaza. More than 200 plots are marked on the plaza’s bricks, to be filled with artwork from artists in four categories: family/elementary, family/junior and senior high school, amateur artists, and professional artists. The “LOVE” display is part of the Virginia Is For Lovers campaign, designed to promote vacation experiences throughout the state. 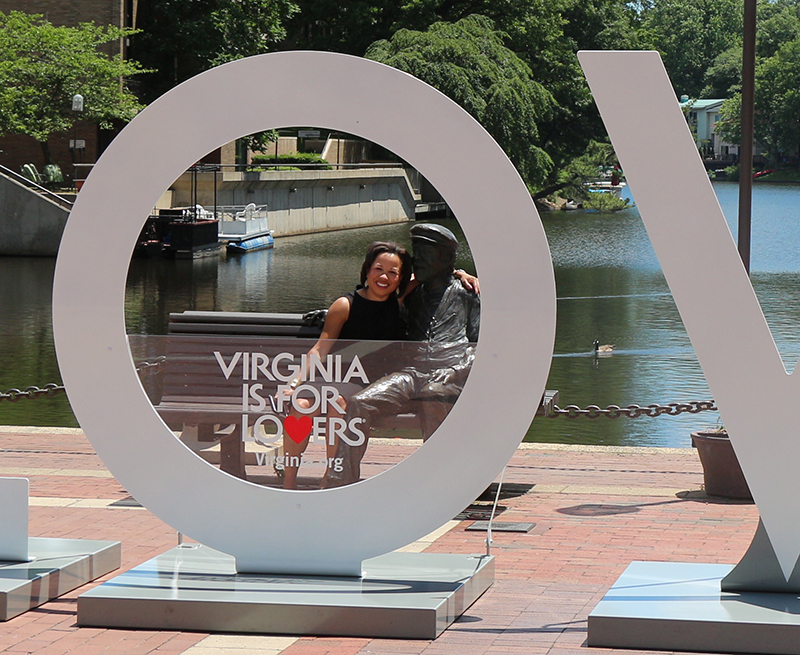 Visitors to any LOVE display throughout the state are encouraged to take their picture with it and share it on social media using the hashtag #LoveVA. 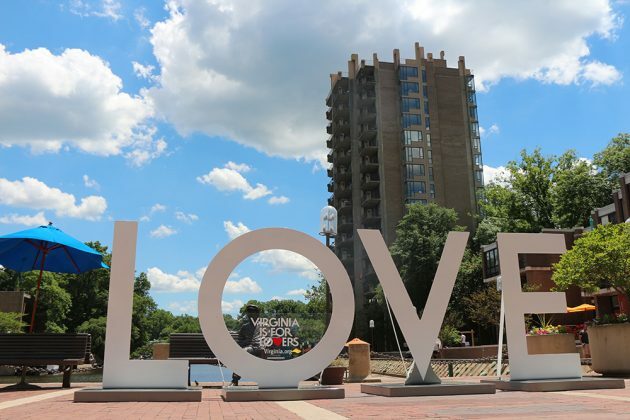 The “LOVE” display was last in Reston in 2015, when it was set up in Fountain Square at Reston Town Center. Potts said she is hopeful the display and the chalk festival will both shine a spotlight on what the plaza has to offer.